Rose water has long been an important component of religious ceremonies. Mosques use rose water as part of their mourning rites. The intent is to calm the mourners with the scent of rose water. Today, rose water is an all-natural ingredient included in many facial care products like toners. The fragrant formulations prep your skin for makeup applications while also preventing acne and wrinkles. The following are the best ways rose water toner can promote healthy skin. Use rose water toners in conjunction with a mild cleanser. After washing your skin, dab with the toner to wipe away trapped dirt or makeup. Any leftover residue from the cleanser is removed too. One of the worst skin issues to deal with is inflammation. Inflamed skin is irritated and red. Vitamin C and vitamin A in rose water toner formulations helps calm the skin. Studies have proven how effective rose oils are when dealing with serious skin issues like edema. Because of its anti-inflammatory and nourishing qualities, rose water is also used in all-natural treatments for dandruff. Not all toners are astringents, but rose water toner successfully constricts the skin after exposure. This makes your skin smoother, with a reduction in the size of pores. If you have puffy eyes, dab under them with a cotton ball soaked with rose water for quick relief. In most toners and astringents, alcohol is the main ingredient used to minimize pores and tighten skin, yet alcohol is harsh and irritating on the skin. Rose water’s mild properties calm the skin while still acting as an astringent. Rose water toners are also an appropriate option for those who want to set their makeup applications. Many toners leave your skin feeling dry. You may notice flakiness after regular astringent and toner usage. Rose water toner hydrates the skin as it works to restore balance. The toner is a must for anyone who spends a lot of time outdoors and wants to reverse the sun’s damaging effects. To take advantage of rose water toner’s moisturizing effects, don’t rinse off the mixture after application. Allow the toner to soak into your skin and dry completely. If you want to follow an all-natural skincare routine, choose products like coconut or jojoba oils as your moisturizer. One of the root causes of skin breakouts is the presence of bacteria on the surface of the skin. In a 2002 study published in the “Archives of Pharmacal Research,” rose oil was listed as one of the essential oils with antimicrobial properties. Rose oil prevented the formation of certain forms of staph and E. coli bacterium. By eliminating bacteria on the skin, you naturally clear up acne without reliance on harsh chemical remedies. The antibacterial features of rose water also make it useful for wound healing. If you have cuts or scars, the toner promotes the healing process and diminishes blemishes left over from the wound. Acne breakouts are caused by several factors. Besides the presence of bacteria on the skin’s surface, oily skin also causes pimples. Rose water toner dries up oily facial skin and restores pH balance. Besides applying the toner after daily face washing, you may also want to use rosewater toners as a makeup remover. Many facial creams and lotions contain ingredients that cause skin irritation. After applying retinol-based creams, you need a product with the ability to counteract any irritants. Individuals suffering from skin issues like rosacea, can safely use rose water for healing properties. Antioxidants protect against damage from free radicals. Free radicals exist in the environment and cause premature signs of aging. A 2009 “Food and Chemical Toxicology” study asserts the superior levels of antioxidants found in species of roses. Rose water toners act as a barrier to protect your skin against free radicals. Sun damage has long and short-term effects on the skin. As sunburn heals, you’ll experience pain and discomfort. Advance the healing by gently applying rose water essential toner. Not only will the product hydrate skin as you heal, but also prevent permanent damage. Rosewater toner slows the progression of wrinkles and fine lines resulting from sun exposure. An alternative way to use rose water toner is after shaving or waxing. Following hair removal, your skin may feel dry and irritated. The toner prevents shaving issues like razor burn and adds moisture to the skin. Although you may not think a toner can help lift your spirits, rose water has proven to do just that. The fresh floral scent is refreshing. Spritz the toner on your face after cleansing and you’ll feel instantly energized. Put a few drops of rose water on your pillow before bed to help relax your mind and body. To manufacture all-natural rose water, rose petals are steamed and distilled. Since rose water has a calming effect on the skin, individuals with all skin types benefit from the product. Check ingredient labels of any rose water product you decide to add to your skincare routine. Choose brands with all natural, safe ingredients. Many manufacturers mislead consumers by selling “rose-scented” toners. 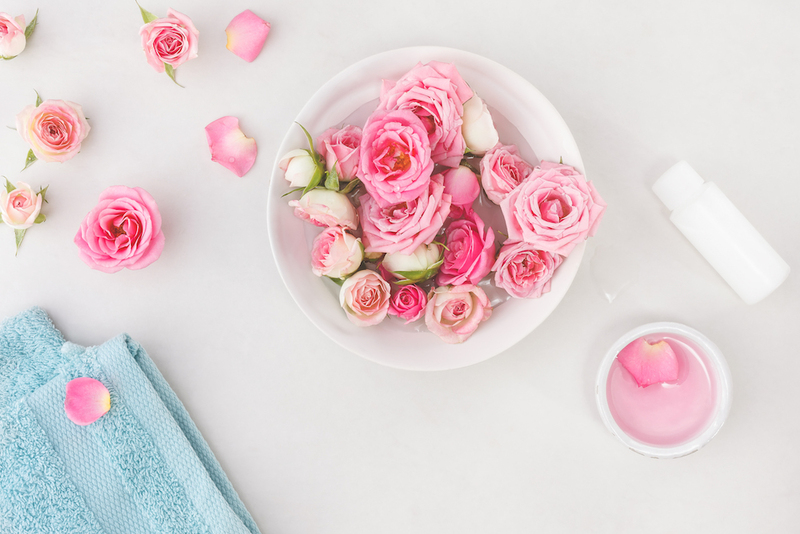 Although there are no side effects associated with rose water, products with fragrances and harsh chemical irritants can lead to skin issues.